Every winter they put their modern lives on hold to cram tents, armour, swords and axes into trucks and station wagons for the trip to Caboolture, along the Bruce Highway and back in time. These are the Abbey Medieval Tournament’s reenactors, everyday people who don the garb of knights, maidens, scribes and artisans to celebrate history, educate the public, and hack at each other with swords. 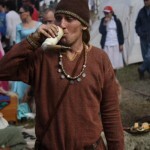 Some may think of medieval reenactment as the refuge of the tragically geekish or the socially inept, but what is it that really drives these people to take on the roles of people who lived hundreds of years ago and thousands of kilometers away? One of the festival’s chevaliers might offer the answer. Damien Fegan is relaxing on a sumptuous bed in a large tent belonging to his group, the Knights Order of Lion Rampants. Rustic knick-knacks, weapons and treasure chests are everywhere, all part of the group’s 14th Century setting and all accurate to period, although Fegan himself is reading from suspiciously white, crisp computer paper. A self-described “tragic history nerd,” Fegan says with a certain amount of relish that the research involved in ensuring accuracy for the group is a constant crusade. “I put together an electronic database for them to use so they weren’t bothering me constantly with questions,” he says. Despite his very grown-up focus on the academic side of things, Fegan still seems to have a mischievous love for the swashbuckling and the battles. “If you can think of a rugby brawl with axes without the ball, that’s the essence of tournament. And no red cards,” he laughs. Not far away, the much more sedate Companye of Northumberland has set up a collection of tents. 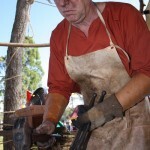 Their camp is a miniature medieval market, complete with artisans who go about their business while explaining their trade in painstaking historical detail to onlookers. 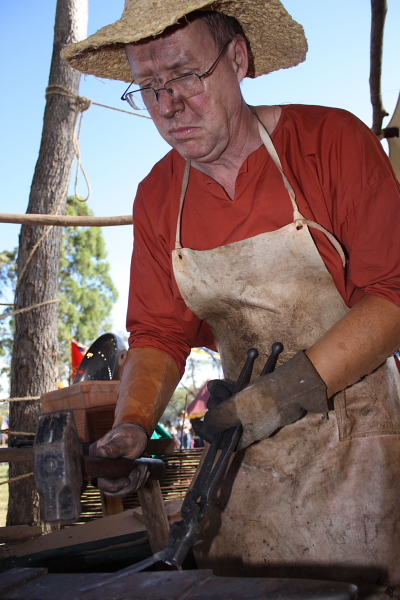 The blacksmith, a sooty, bespectacled man named Martin Wynn-Hughes, bangs away at a glowing piece of metal, making knives, cauldrons, armour and tools for the group. Although the hobby is a very practical one, Wynn-Hughes says researching how things were done in the times of yore is just as interesting as making them today. “Basically it’s a living history,” says Anthony Beecham, the group’s burly rope-maker. For Beecham, reenactment is a family affair. His wife does tablet weaving for the group and he took up rope-maker after his kids were impressed with the process during a trip around the medieval fairs of Europe. But while for some the interest is intellectual, for others the connection with history is more personal, and for some almost spiritual. 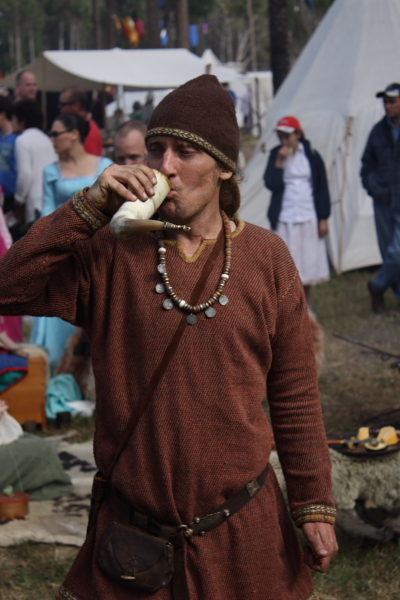 Jason Armfield cuts a mean figure as a 10th Century viking and leader of the Stray Dogs. His eyes scowl out from dark smudges of black coal and one of his heavily tattooed arms bears a scar from where a sword took a chunk out of his bicep. In fact, his commitment to the standover image of medieval warriors is so strong he even had a dental plate fashioned into a row of fearsome fangs to replace his teeth. Although Armfield got into medieval reenactment as a young thrill seeker drawn to the fighting, he now feels like the sense of community and the gatherings are more important than the public performance. “It’s such a minor element of the whole show,” he says. But for Wynn Green, another Stray Dog, it’s all about finding his roots and reclaiming his heritage. Green was just a boy when he came from England to Australia, but says he’s always felt a connection to his European heritage, like a pigeon that knows instinctively where home is. He spent his youth reading books on Western history to find out more about his cultural identity, but in the end exploring where he came from meant going beyond books to actually living it. 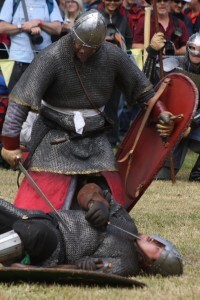 This intimate connection to the middle ages is not exclusive to reenactors, says Dr Kim Wilkins, an author and academic who has written extensively on medievalism. “Even though we’re distinctly Australian and we’re multicultural and so on, that white western heritage still very much constitutes a large part of our culture,” she says. Dr Wilkins says medievalism has always influenced Australian culture, from our national anthem to the popular culture of today, and that reenactors, far from being strange, are just an embodiment of that connection.